The First Judicial District Commission on Judicial Performance unanimously recommends that Judge Jean Woodford BE RETAINED. Judge Woodford was appointed to the Jefferson County Court in August 2012. Prior to her appointment, Judge Woodford was the First Assistant Attorney General for the Colorado Attorney General’s office. Previous to this, she was the Acting District Attorney and Deputy District Attorney for Colorado’s 7th Judicial District. 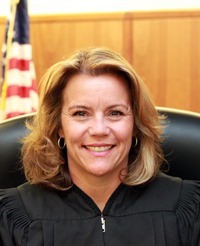 Judge Woodford received a Bachelor of Arts degree in political science from the University of Colorado, and earned her law degree from the University Of Colorado School Of Law. Judge Woodford believes that community involvement is important in her role as a Judge. She participated in the county’s High School Mock Trial competition and has hosted a Girl Scout troop and middle school group in her courtroom. She has taught at a DUI Continuing Legal Education class, and is currently on the planning committee for the upcoming annual state judicial conference. The Committee reviewed the Judge’s self-evaluation, reviewed opinions she authored, and examined survey results sent out to attorneys and non-attorneys. It should be noted that Judge Woodford is a fairly new judge, and that the survey results cover approximately 16 months of her tenure on the bench. Judge Woodford received higher than average scores from attorneys in the area of showing bias towards the prosecution. The average score for County Court judges being evaluated this year was 35% showing bias towards the prosecution, while 58% of attorneys perceived Judge Woodford as showing bias towards prosecution. In her interview with the Commission, Judge Woodford indicated that she does not believe that she is biased, and presented her sentencing statistics to the committee, which show that she is consistent with her peers in jail usage space. Judge Woodford indicated to the committee that she is concerned about this perception, and will work to improve in this area. Survey results also indicate that Judge Woodford is viewed by both attorneys and non-attorneys as having a calm and professional demeanor in the courtroom, is clear in her rulings and instruction, and is highly knowledgeable in areas of law and procedure. Of attorneys responding to the survey, 71% recommended Judge Woodford be retained, 18% not to retain, and 10% made no recommendation regarding retention. Of the non-attorneys responding to the survey, 80% recommended Judge Woodford be retained, 10% not to retain, and 10% made no recommendation regarding retention. Judge Woodford sees herself as a solid beginner who will improve with experience. Commission members believe that Judge Woodford is a hard-working judge who demonstrates fairness and compassion on the bench. The Commission feels that Judge Woodford will continue to grow and improve over time. Based on these findings, the Commission unanimously recommends that Judge Woodford BE RETAINED.